My mom's (or should I say 'Momma') family is all from the Southern US. I have a gaggle of aunts, uncles and cousins strewn about North & South Carolina, Georgia and Florida. You might remember me mentioning our house in the mountains of NC here, here, and here. One summer when I was about 11 the family sat on the long wrap around porch admiring my uncle Wray's new truck. It was a big deal because it was his first brand new vehicle. This truck was the symbol of a lot of hard work. Uncle Wray had started his own company years back and was just starting to reap some reward from all his hard work. It was heavily kitted out with all the extras. I remember, even at 11, being rather in awe of this fancy truck. We walked down to the drive way to have a closer look and rub it with a diaper (I am totally sort of kidding) While doing a turn around the truck I noticed a sizable scratch on the back bumper. (read with your best in your head southern accent) "I don't even know, happened in the parking lot while I was in the store." Shaking his head "Can't have nuttin' nice"
Even at the time I could relate. Only a few years earlier my cousin Noah had broken my newly opened Barbie Bubbling Spa on Christmas morning. I had barely had a chance to play with it when he broke the mechanism that made the bubbles. My dad did fix it but had to crack open the back leaving it less than perfect. I got closer to forgiving Noah after I punctured numerous hole in his new bongo drums with the Christmas nut pick but I never fully did and still carry a grudge to this day. 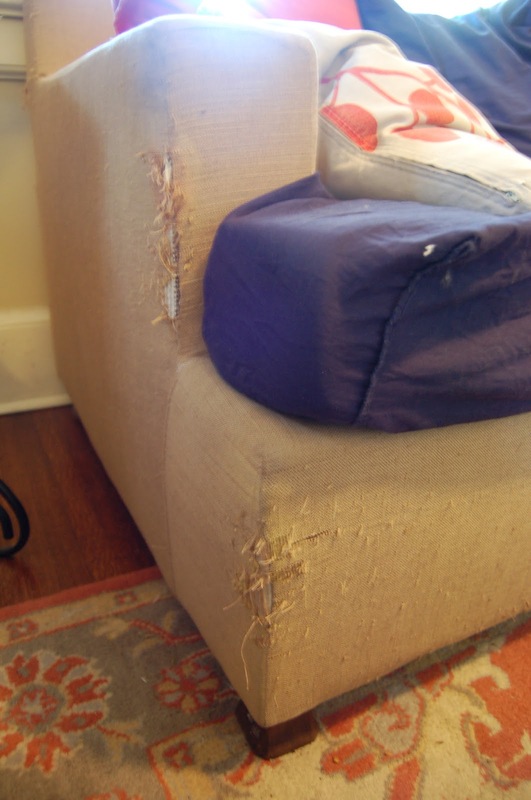 Really some of the worst damage to my 'stuff' has been done by pets. This use to be a beautiful couch. 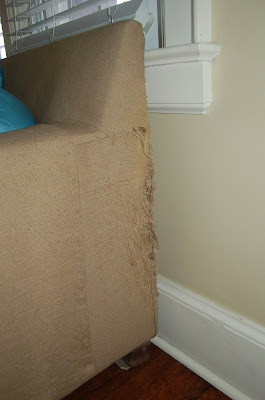 I had it professionally reupholstered about 7 years ago with a beautiful linen I found on sale. Within 6 months of it being covered our dog barfed on it during the night. 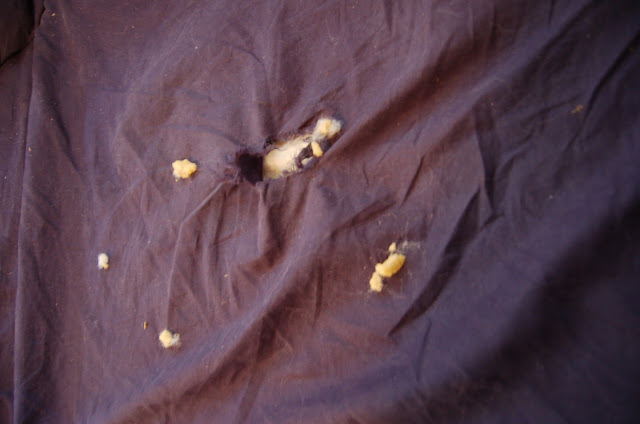 By the time it got cleaned up the next morning the barf had bleached a lighter spot into the fabric. 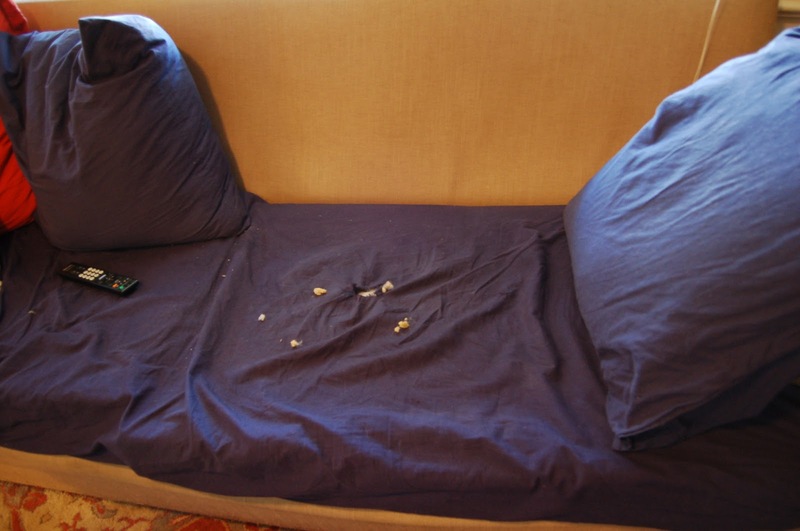 Nothing that couldn't be fixed by flipping the cushions over but nothing could fix the damage the cat unleashed. I wish the weather would finally decide weather it is going to be winter or spring (see what I did there?) This year the seasons have felt particularly weird. More and more of us are getting sick as the temperature fluctuates 10-12 degrees in one afternoon. Yes I know that temperature or wet hair in the cold doesn't make you sick but it certainly taxes your immune system. I agreed. A picnic was needed. So instead of guacamole I sliced the avocado and we ate it along with tuna salad boats and a make shift fruit salad (what we had cut up) I lay a blanket on the floor, we drank out of canteens and I even dragged out a couple of Lara Bars for dessert. It made me feel a bit better but not about the weather. Do you need a restorative picnic? 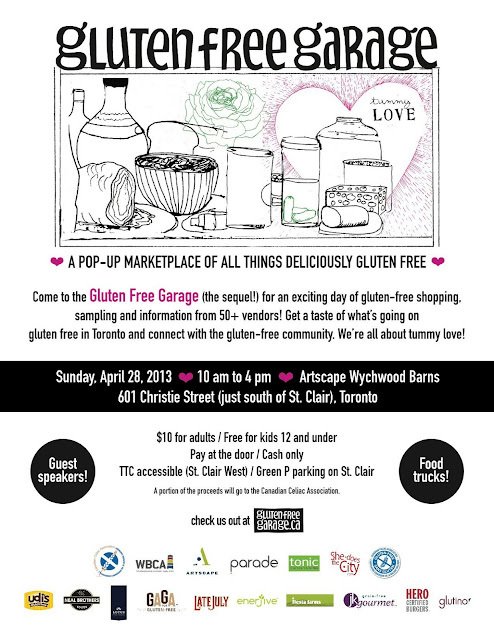 I'll be there sitting with Jax at the Gluten Free Ontario Table (cause she's cool like that) See you there!! I think many of us are craving for something real. For real connection to a real community. It is easy to sell the best parts of ourselves but often much harder to feel safe putting a more fragile self out there. The self that maybe couldn't live up to the projection. Our projected selves have some how become more available than the real thing....almost more fully developed and yet, so much harder to live up to....and damn near impossible to connect to. I pride myself on not projecting a supermom here but I also haven't let you see the greasy underbelly of making the life choices of being a real food mama. Sometimes other things get left. And sometimes they get left for a couple of weeks. 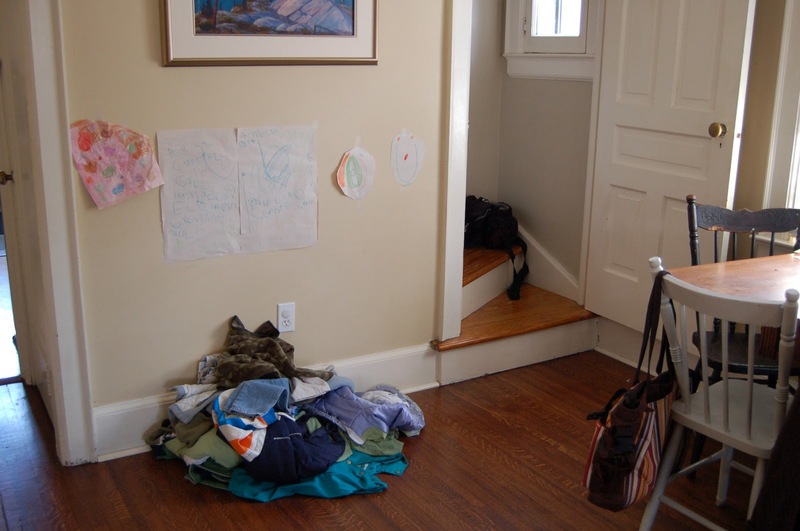 This is the pile of clothes that has been sitting on our dining room floor for over 2 weeks. It isn't laundry but winter stuff the kids have grown out of. As the weather has been slowly getting warmer I have been slowly cleaning out closets adding to this pile as I have dug things out. I would like to say that I keep a spotless house but the truth is - I am way too busy to be able to keep up and the last few weeks have been worse than usual. I know a pile of clothes on the floor doesn't seem like much but I need to stress the point......it has been sitting there for almost 3 weeks and I'm still not sure when I can get to it. Link-up your own blog-post every Monday on the RealMamaLife blog post at www.lepetitreve.ca, or share bits of your mad and lovely life on Instagram or Twitter – by simply by using the hastag #RealMamaLife. I will come clean right from the start. 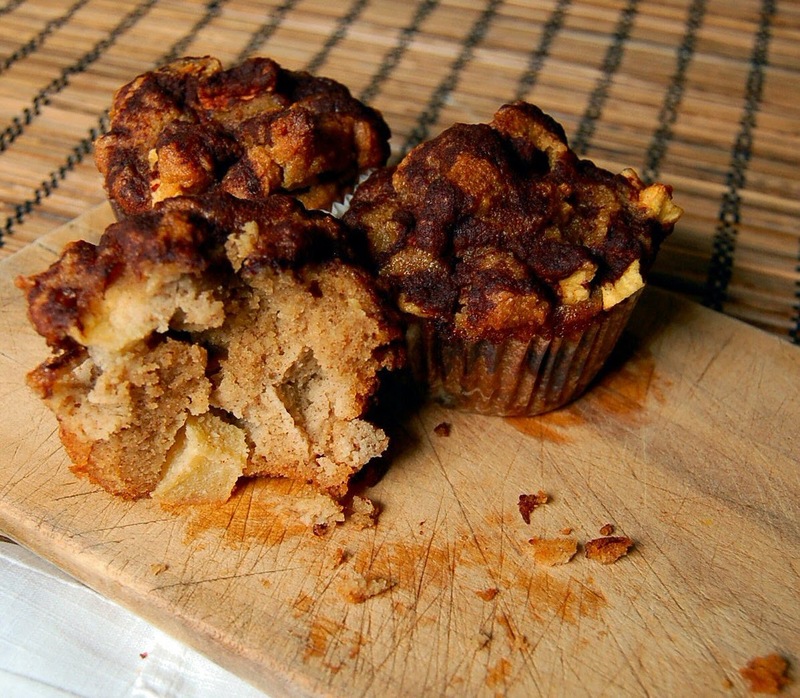 This recipe is not my own......in that it is a very slightly altered version of the absolutely amazing Apple Spice Coffee Cake by Danielle at Against all Grain. My kids will often say over a meal they particularly like "YUM! Mummy is the best cooker". I won't give myself that much credit but I will say "I'm a pretty good cooker". There is a saying that 'cooking is an art, baking is a science' and this couldn't be more true than when you are dealing with food restrictions. I am a pretty good cooker but I'm not a great baker. Now not all cake recipes can just be poured into muffin tins. Some need a little wigglin'. And that is the case for this recipe. Even though my household is slowly moving toward a mostly Paleo diet we are struggling with breakfast for the kids. I can happily eat dinner leftovers but the kids are fond of breakfast foods.....and don't want eggs everyday. I have been making huge batches of low-grain granola that is eaten with either almond milk or some fruit and yogurt but no one wants to eat that everyday. On weekends I can make some grain free waffles but school days are difficult. It also doesn't help that they have reached an age that they are acutely aware of foods that are being marketed to them. I talk to them, usually in the grocery store while looking at the ingredients list, why we don't eat those foods. I explain what certain ingredients are and how they make us sick. I explain how lucky they are to have a Mummy that knows this stuff. They are really good about understanding why we don't eat it and rarely really fuss or complain. It helps that I always promise to make a healthy version and more often then not they kinda forget these promises......but there is one they haven't let go of.....that some kids get to eat chocolate for BREAKFAST!!! They bring this up fairly regularly. Reminding me that I promised to make a chocolate breakfast. So here we are. Not Paleo, not grain free, but it is gluten free, dairy free and sugar free. 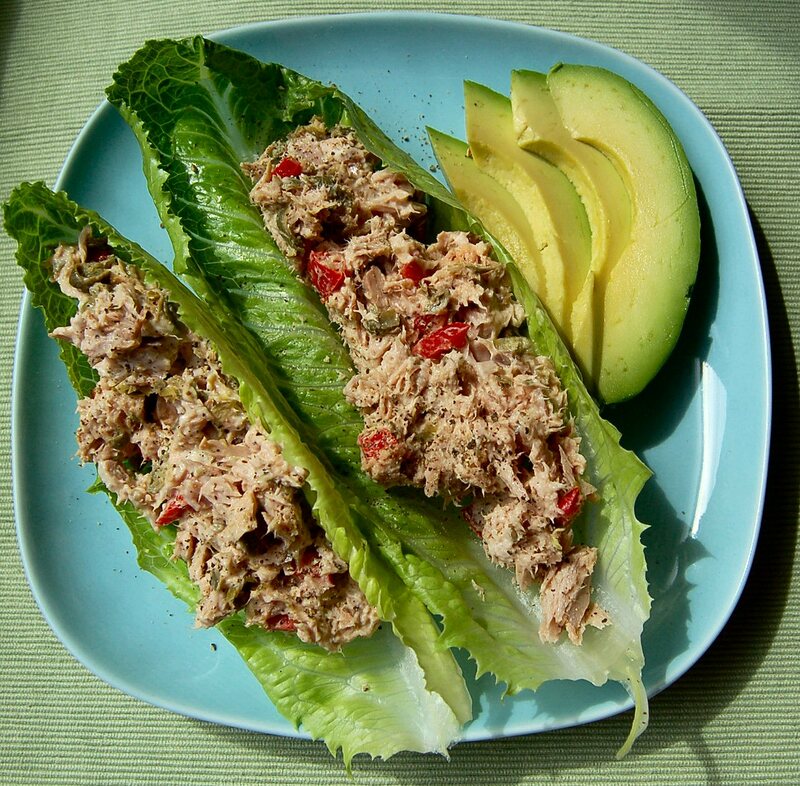 It is terribly simple and simply delicious. Follow the instructions on your gluten free oatmeal. Just before it is done stir in a couple of tablespoons of dairy and sugar free cocoa powder (I also like to make sure it is free trade real cocoa) Combine until creamy. This might require the addition of a tbsp or 2 more of water. Gently fold in fresh or frozen raspberries just before serving. 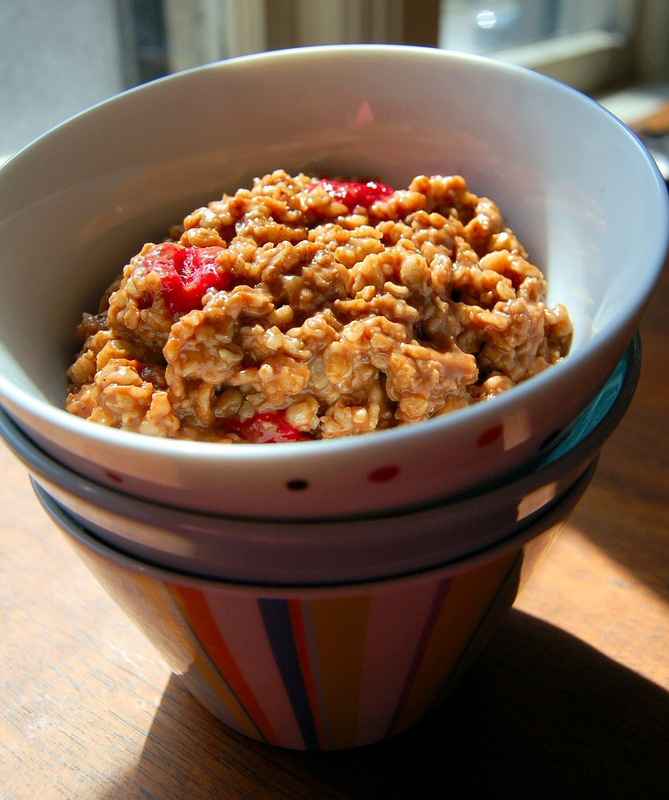 Serve with a tsp of coconut oil, honey and some almond milk. And make sure you make a suitable fuss, so they think it is a big treat.